The domain within your query sequence starts at position 273 and ends at position 342; the E-value for the CT domain shown below is 1.23e-10. 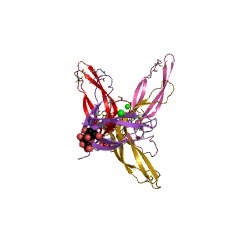 The structures of transforming growth factor-beta (TGFbeta), nerve growth factor (NGF), platelet-derived growth factor (PDGF) and gonadotropin all form 2 highly twisted antiparallel pairs of beta-strands and contain three disulphide bonds. The domain is non-globular and little is conserved among these presumed homologues except for their cysteine residues. CT domains are predicted to form homodimers. 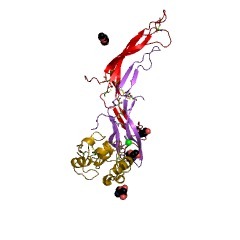 Four recent crystal structures of growth factors--nerve growth factor, transforming growth factor-beta, platelet-derived growth factor, and human chorionic gonadotropin--from four separate superfamilies revealed that these proteins are structurally related and share a common overall topology [(PUBMED:8490958)]. These proteins have very little sequence homology, but they all have an unusual arrangement of six cysteines linked to form a "cystine-knot" conformation. 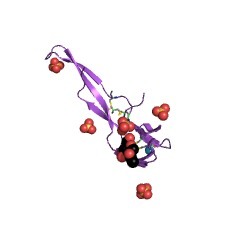 The active forms of these proteins are dimers, either homo- or heterodimers [(PUBMED:7663117)]. Because of their shape, there appears to be an intrinsic requirement for the cystine-knot growth factors to form dimers. This extra level of organisation increases the variety of structures built around this simple structural motif [(PUBMED:7583638)]. There are 7744 CT domains in 7736 proteins in SMART's nrdb database. Taxonomic distribution of proteins containing CT domain. This tree includes only several representative species. The complete taxonomic breakdown of all proteins with CT domain is also avaliable. 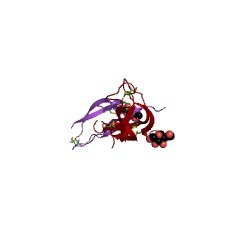 Click on the protein counts, or double click on taxonomic names to display all proteins containing CT domain in the selected taxonomic class. 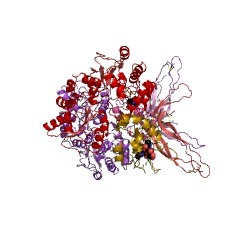 Recent reports of the crystal structure of the glycoprotein hormone human chorionic gonadotrophin show that cystine knots are proving to be versatile structural motifs that enable the construction of a variety of proteins with different functional properties. Because of their shape, there appears to be an intrinsic requirement for the cystine-knot growth factors to form dimers. This extra level of organization increases the variety of structures built around this simple structural motif. 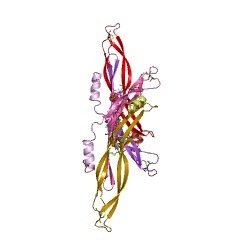 Four recent crystal structures of growth factors--nerve growth factor, transforming growth factor-beta, platelet-derived growth factor, and human chorionic gonadotropin--from four separate superfamilies revealed that these proteins are structurally related and share a common overall topology. These proteins have very little sequence homology, but they all have an unusual arrangement of six cysteines linked to form a "cystine-knot" conformation. 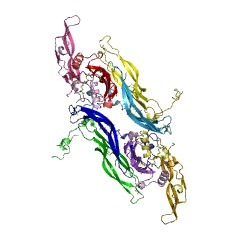 The active forms of these proteins are dimers, either homo- or heterodimers. Despite the overall topological similarity between the monomers, the interfaces used to form the dimer are in each case quite different. Because the surfaces used for dimer formation are mostly hydrophobic, the uniqueness of each dimer accounts for the lack of sequence homology and raises questions about the effectiveness of reverse sequence fitting in this kind of structure as a predictor of structural homology. Crystal structure of a disulfide-linked "trefoil" motif found in a large family of putative growth factors. Porcine pancreatic spasmolytic polypeptide (PSP) belongs to a large family of homologous growth factor-like polypeptides characterized by a disulfide-linked "trefoil motif," duplicated and conserved in various family members. PSP contains two trefoil motifs, has several pharmacological actions on the gut, and has growth factor properties on epithelial cells in vitro. The human PSP analogue, human spasmolytic polypeptide, appears to be involved in many regenerative situations and, especially, in healing gastrointestinal ulcers. One member of the trefoil family, pS2, is secreted in approximately 50% of estrogen-dependent human breast carcinomas, which has led to its use as a tumor prognostic marker. Both pS2 and human spasmolytic polypeptide are also widely expressed in chronic gastrointestinal ulcerative conditions such as Crohn disease. 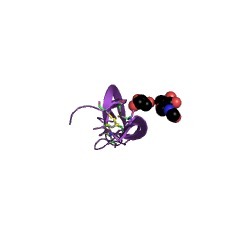 Here we report the three-dimensional structure at 2.6-A resolution of a trefoil-containing protein, namely PSP, purified from porcine pancreas. 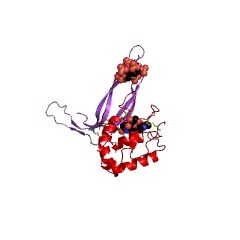 The structure shows two homologous domains that share a supersecondary structure and disulfide bond pattern. The two domains pack asymmetrically giving rise to a number of protruding loops, exposed clefts, and an unusual electrostatic surface potential. Knowledge of the structure of PSP should allow the design of mutants to investigate further the function of PSP and other trefoil-containing peptides. 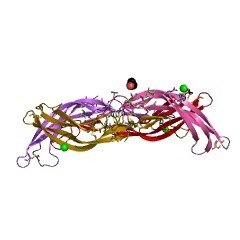 Crystal structure of human chorionic gonadotropin. The three-dimensional structure of human chorionic gonadotropin shows that each of its two different subunits has a similar topology, with three disulphide bonds forming a cystine knot. 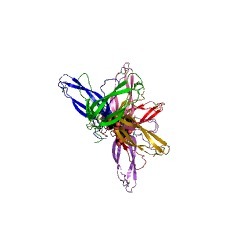 This same folding motif is found in some protein growth factors. 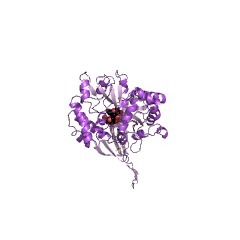 The heterodimer is stabilized by a segment of the beta-subunit which wraps around the alpha-subunit and is covalently linked like a seat belt by the disulphide Cys 26-Cys 110. This extraordinary feature appears to be essential not only for the association of these heterodimers but also for receptor binding by the glycoprotein hormones. The P-domain or trefoil motif: a role in renewal and pathology of mucous epithelia? By analogy with epidermal growth factor and EGF-like repeats, the P-domain, or trefoil motif, is a characteristic shuffled module containing six invariant cysteine residues that forms the basic unit for a family of mucin-associated peptides. These P-domain peptides are potential modulators of cell growth and they are also expressed under certain pathological conditions. Furthermore, P-domains have been found as components of extracellular mosaic proteins including certain mucins, where they are thought to play a role either in protein-protein or in lectin-like interactions. A structural superfamily of growth factors containing a cystine knot motif. Molecular modelling of the Norrie disease protein predicts a cystine knot growth factor tertiary structure. The X-lined gene for Norrie disease, which is characterized by blindness, deafness and mental retardation has been cloned recently. This gene has been thought to code for a putative extracellular factor; its predicted amino acid sequence is homologous to the C-terminal domain of diverse extracellular proteins. 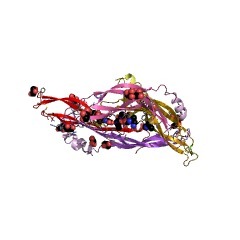 Sequence pattern searches and three-dimensional modelling now suggest that the Norrie disease protein (NDP) has a tertiary structure similar to that of transforming growth factor beta (TGF beta). Our model identifies NDP as a member of an emerging family of growth factors containing a cystine knot motif, with direct implications for the physiological role of NDP. The model also sheds light on sequence related domains such as the C-terminal domain of mucins and of von Willebrand factor. Topological similarities in TGF-beta 2, PDGF-BB and NGF define a superfamily of polypeptide growth factors. BACKGROUND: The development of functional diversity through gene duplication and subsequent divergent evolution can give rise to proteins that have little or no sequence similarity, but retain similar topologies. RESULTS: The crystal structures of nerve growth factor, transforming growth factor-beta 2 and platelet-derived growth factor-BB show that all three are based on a cystine-knot plus beta-strands topology. There is very little sequence identity between the three proteins and the relationship between the structures had not been deduced from sequence comparisons. Each growth factor is usually active as a dimer; each exists as a dimer in the crystal, but the relative orientations of the protomers are different in each case. CONCLUSION: The structural motif of disulphide bonds and hydrogen-bonded beta-strands unexpectedly found in these three growth factors acts as a stable framework for elaboration of loops of low sequence similarity that contain the specificity for receptor interaction. SwissProt sequences and OMIM curated human diseases associated with missense mutations within the CT domain. This information is based on mapping of SMART genomic protein database to KEGG orthologous groups. Percentage points are related to the number of proteins with CT domain which could be assigned to a KEGG orthologous group, and not all proteins containing CT domain. Please note that proteins can be included in multiple pathways, ie. the numbers above will not always add up to 100%.